Posted in Beef, on March 13th, 2008. Certainly you’ve had Beef Wellington at some time in your life, haven’t you? I’ve even made it a couple of times in individual servings. Very good. This recipe is kind of like a Beef Wellington except the beef is already cut into cubes, and it’s combined with a mushroom sauce inside, then served with a wonderful spicy horseradish sauce on the side. The recipe is Phillis Carey’s, from a recent cooking class. The subject of the class was “entertaining entrees.” And yes, they were. Are. For entertaining. Two other recipes from the class I probably won’t make (a pork tenderloin with port fig sauce and a chicken breast stuffed with spinach) as they weren’t very “wow,” in my book, anyway. If the recipes don’t wow me, I don’t even enter them into my recipe software program. But the orange roughy with leek sauce and this one I entered immediately. The best thing about this beef tenderloin in puff pastry is that you can make it up ahead – like a week or so and freeze it (and bake it 10 minutes longer) – or you can make it up to 4 hours ahead and keep refrigerated until you’re ready to bake for your guests. I like those kinds of options when I’m entertaining. The origin of the horseradish chive sauce is interesting. Phillis loves the jar of similar sauce made by Rothschild, and she looked at the ingredients on the jar and created a sauce very, very similar to it. Certainly cheaper. And really quite easy. She combines sour cream, mayo, chili sauce (not the hot type, more like a thick spicy catsup), garlic, horseradish and chives. Everybody in the class was “mmmm“-ing while we ate it. I made these for a dinner party last weekend. Got lots of ahhhs. And I promised to post the recipe for our guests so they can make this themselves. The beef: gorgeous tender tips of fillet mignon briefly browned; a sauce with mushrooms, onion, garlic, dry sherry, broth; puff pastry cut into quarters and rolled out to a larger square. 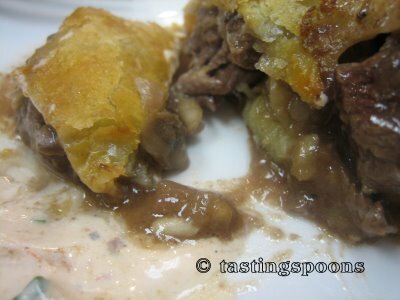 Beef and sauce in the center, pastry edges brushed with egg then pressed together into a kind of envelope. Then it’s baked in a hot oven. Have your dinner all ready during the last 5 minutes of baking – maybe even get your guests seated at the table. Whisk out the pastries and serve them immediately. I did learn something in making these myself . . . I had a box of puff pastry in my freezer already. I also bought another one, because we had 9 people for the dinner party. I hadn’t looked at the dates on either package, but the newer purchased one was actually older than the one I had in my freezer. I could tell the difference. Some of the dough stuck to itself. I managed, but it was a little bit difficult. So, my advice is to buy fresh (well, it’s frozen) puff pastry and don’t keep it long. I also didn’t buy the recent package at a regular grocery, but an independent market, so it had been there in their freezer for nearly a year. The more recently frozen the puff pastry, the more likely it will be easier to roll out and manipulate. Just be sure to defrost the puff pastry a day ahead – in the refrigerator. Don’t just set the box on the kitchen counter, or the pastry sheets will stick to themselves. The beef cubes need to be ever-so-quickly browned. That’s it. Just browned. They need to be still very, very red inside since they bake for an additional 15 minutes, and you’d like the meat to still retain a bit of pink. If you freeze the pastries, they are baked differently – don’t defrost them. Bake from a frozen state, at 400 for 25 minutes. And I’m being repetitive here, but serve them immediately. No dilly-dallying even 5 minutes. 1. Melt the 2 T. butter in a large skillet over medium high heat. Add beef cubes, in batches if necessary, and brown well, leaving the center of the meat very red. Season beef with a bit of salt. Transfer to a bowl. 3. Cut each puff pastry sheet into 4 squares. Roll out 6 pieces into 6-inch squares. Divide the meat/mushroom mixture evenly among the squares. Brush edges of pastry lightly with the egg/water wash. Bring two opposite corners over the filling and overlap to seal. Bring remaining two corners over the others and seal well. 4. Turn pastries over, onto a parchment-lined baking sheet. Cut decorations from the remaining two squares. Brush the pastries with egg and decorate. Brush decorations with egg and chill until ready to bake, up to 4 hours. (Or freeze up to a few days ahead. Do not bake the pastry first if you’re freezing them.) Poke two small holes in the top of each pastry to allow steam to escape. 5. Meanwhile, make Horseradish Sauce: combine all ingredients and chill at least one hour and up to 24 hours. 6. Preheat oven to 425. Bake for 15 minutes, or until well browned and heated through. Serve IMMEDIATELY with a dollop of sauce on the side. If you freeze the pastries, they are baked differently – don’t defrost them. Bake from a frozen state, at 400 for 25 minutes. Per Serving: 694 Calories; 61g Fat (79.2% calories from fat); 25g Protein; 11g Carbohydrate; 1g Dietary Fiber; 161mg Cholesterol; 324mg Sodium.